Minjungbal Aboriginal Cultural Centre, Minjungbul, Bundjalung people, North Coast, Northern Rivers, NSW, QLD, Byron Bay, Tweed Valley, Gold Coast, Aborigines, Dreamtime, Bora Ring, Bundjalung, Bundgulung. 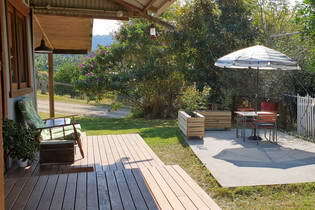 For many thousands of years, the Tweed Valley was a green paradise resting in the shadow of the majestic Wollumbin. 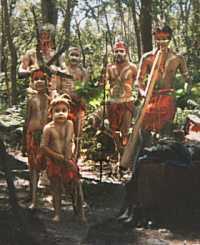 The Bundjalung people enjoyed a warm sub-tropical climate. The landscape varied from towering mountains to the bountiful sea, providing an abundance of food and materials that met all their needs. Wollumbin, the mountain today known as Mt Warning, towers 1100 metres above the sea. It was named by Captain James Cook in 1770, as a warning to other seafarers, of the numerous treacherous reefs along this coast. He did not know that the Bundjalung people for many miles around called the mountain Wollumbin, and that it was an important sacred site*, as their lives and religion were strongly linked to the land. Their religion provided an explanation for the world as experienced by the Bundjalung people and it gave them the laws that they followed daily. The foundation of their beliefs was the Dreamtime or [The] Dreaming. They learned from their fathers over the centuries that the land was created through the movement and creation of spiritual beings and the creatures of nature. 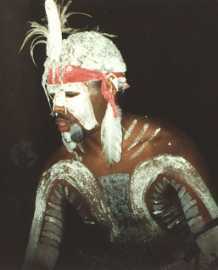 There is a dreamtime story of Wollumbin, said to be Warrior Chief of the mountain. The spirits of the mountains were warriors. The wounds they received in battles can be seen as scars on the side of the mountain and the thunder and lightning are the effects of their battles. When you look toward Wollumbin from the north, you can see the face of the Warrior Chief in the mountain's outline. Another sacred site with special significance for the Minjungbal people is located at South Tweed Heads. There is the sacred Bora Ground, and surrounding bushland that links them spiritually to their ancestors. It was last used traditionally in 1910. In the late 1950's, an Aboriginal lady named Margaret Kay spent years restoring the Bora Ring that was shown to her by her relatives. Applying to the council for it's preservation, her efforts were rewarded in 1961, where the Bora ring and 125 hectares of surrounding bushland, including Ukerabagh Island, was reserved for the preservation of Aboriginal Relics. Margaret managed the Bora Ring with help of children from the local community. She also established a little museum at the front of her house and continued to contribute her knowledge and energy to the site until her death in 1967. Implements and relics of all sorts and endangered flora and fauna are still being discovered and knowledge of indigenous culture still being expanded as a result. The Minjungbal people today are thus able to sustain their spiritual connection to the site, to keep learning and practicing their culture and to provide a continuing insight for the wider community. The children who were Margaret's helpers grew up to become caretakers of the land, to erect a museum on the site and to eventually establish an educational and tourist resource centre. The Minjungbal Aboriginal Cultural Centre was established in 1988. Today the Centre comprises an office and shop, refreshment kiosk, a fine museum, art gallery and an amphitheatre for outdoor performances, a mangrove boardwalk and walking track and picnic facilities with electric barbecues. Also known as the Tweed Heads Historic Site, it is a NSW National Parks and Wildlife Service Historic Site, and features a boardwalk through the mangroves and a walking track winding through the site, with free use of the picnic facilities and BBQs, and off street parking. Private tours, small groups, school groups and special interest groups of 20+, are welcome. Indigenous guides are available by arrangement, to provide guided interpretive tours through the museum and the historic site with its relics, flora and fauna. For more information telephone (07) 5524 2275. *Details correct as at 30/08/18. Minjungbal Aboriginal Cultural Centre, excerpts from "Minjungbal, Aboriginals and Islanders of the Tweed Valley", by Jolanda Nayutah and Gail Finlay, published 1988. North Coast Institute for Aboriginal Community Education. ISBN: 0 7316 2824 1.